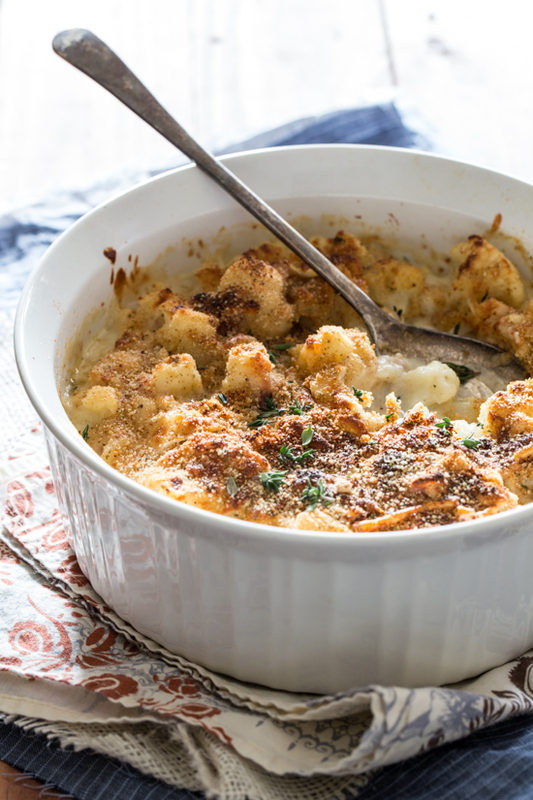 Cauliflower gratin is an amazing Thanksgiving side dish that will keep your family happy! No more boring green beans, when you are looking for a delicious vegetable side dish, turn to this easy, cheesy cauliflower gratin! Last year, I spent the whole of November posting about all of my very favorite, most beloved, super duper delish Thanksgiving recipes. This year, my goal was to play around and move to the next rung of Thanksgiving dishes on the imaginary tiered hierarchy of Thanksgiving food that I like to call, ‘the extras’. 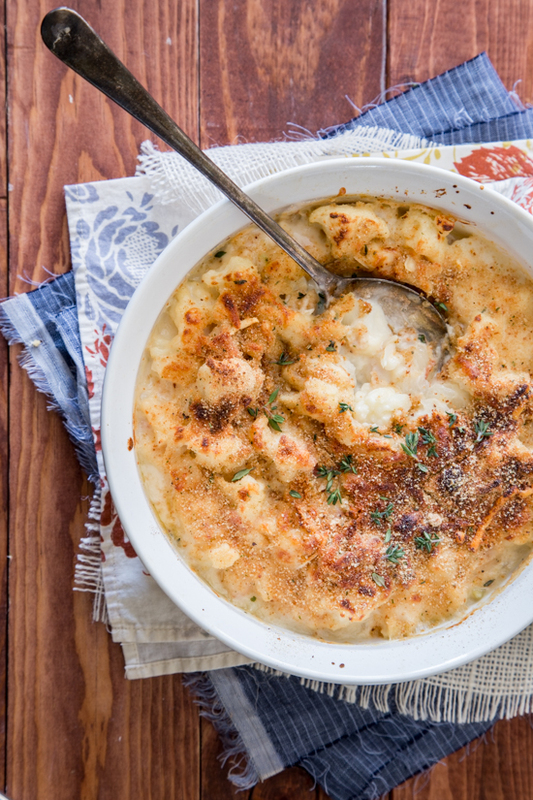 Dishes that are totally necessary to round out the Thanksgiving table, but can change from year to year based on your mood and what recipe caught your eye on Pinterest (like this cauliflower gratin). Anyway, there are certain dishes that just don’t mess with. But (and this is a big but) there are several spots on the Thanksgiving menu that can be mixed up and played with from year to year. Maybe you saw an awesome kale salad recipe that you want to bring, or maybe you’re craving some creamy, cheesy cauliflower gratin. If you haven’t picked up on my hints, I’m the one who’s craving cauliflower. A few years back on Thanksgiving (by a few, I mean at least five) I made this amazing cauliflower gratin. It had prosciutto and cheese and I’ve had this vivid memory of a hot, bubbling dish topped with crispy crunchy topping. I felt like this recipe needed to be brought back, so I went to go get it. Easier said than done. In my flurry of cleaning out old magazines, I seem to have lost the recipe, which I was so beyond bummed about. Searching around on Google didn’t turn up the recipe that I was hoping for, so I decided to go with my gut and cook the cauliflower up the way I remembered it being. Now, I’m not sure if it’s exactly the same (I seem to be thinking now that it had goat cheese in it…) but whether it’s the same or different than the dish of my memories doesn’t really matter when it tastes as good as it does. And boy, does it taste good. You see, think it’s important to have your family classics that stay consistent, but It’s great to have a bit of flexibility in your menu, too. I mean, it might get a wee bit boring if you never brought anything new to the table, right? It’s a day dedicated to eating – so you may as well live it up. And if cauliflower could ever live anything up, it would be in the form of this cauliflower gratin. It’s creamy and cheesy and studded with lovely salty prosciutto. Topped with crunchy bread crumbs, this gratin is a party of textures. It’s so decadent tasting that it closely resembles mac and cheese…just without the mac. I promise, you won’t miss the mac. 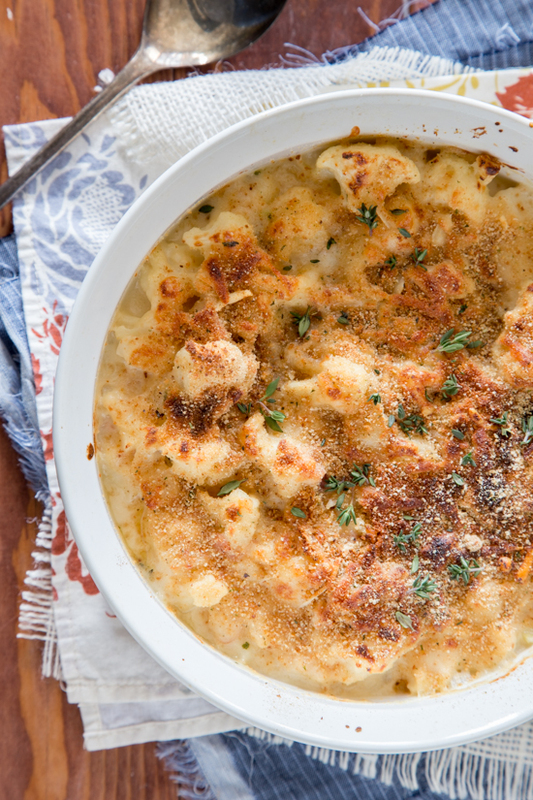 Cauliflower + cheese = good stuff. Preheat oven to 350 degrees. Spray 2 1/2 quart baking dish with non-stick spray and set aside. Bring a pot of water to a boil, and cook cauliflower for 3-5 minutes, or until just beginning to soften. Drain and set aside. In a Dutch oven, melt butter over medium/hight heat. Add onions, garlic and thyme and cook until onions are softened and garlic is fragrant, about 5 minutes. Sprinkle flour over onion mixture and stir to combine. Slowly pour milk into onion mixture, stirring quickly to dissolve all of the flour. Allow sauce to come to a low boil; reduce heat to low. Add 4 oz of gruyere and stir unit cheese is completely melted; stir in prosciutto and season sauce with salt and pepper. Remove from heat. Fold cauliflower into cheese sauce and stir well to coat. Spread cauliflower into prepared baking dish. Sprinkle remaining cheese and bread crumbs on top. Bake for 30 minutes or until sauce is bubbling. I like your choice of gruyere for this, I think I would add some gorgonzola too! I can’t resist a cheesy gratin! This would be so amazing for Thanksgiving dinner! Ugh!! I feel like I should know what show that quote is from and I just can’t pull it out of the vault. I’ll get back to you on that 😉 In the meantime, I feel like I should be noshing on a big ol’ heaping plate of THIS! I’m on such a cauliflower kick right now and this looks amazing. I’m going to add it to my Thanksgiving menu but there’s no way I can wait that long so I’m going to also give it a test run tomorrow! I’m making a roasted chicken and this is the perfect side. Lovely! I could eat this everyday, no kidding. I LOVE cauliflower. 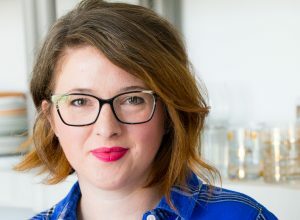 You did right by it in this recipe Emily. I’m curious as to how you think the recipe would be without the meat? The prosciutto adds some saltiness and rounds out the flavor of the entire dish, but that being said, you could definitely leave it out and still have a creamy, flavorful cauliflower side dish! Thanks so much for stopping by! i love gratins! this looks perfect. Thanks so much, Brandi! It was great to meet you at Mixed! I hope you have a wonderful and very happy Thanksgiving! I had been hunting for a cauliflower dish to add to our Thanksgiving menu for my mother-in-law and this appears to be the winner! Thanks for the great recipe, Em!